Most manufacturing industries in the world, be it food production, mining or automotive, use chemicals and machinery that can produce dangerous levels of poisonous gases. The most common types of toxic gases found in modern industrialised work places include: ammonia, methane, hydrogen sulfide, chlorine, carbon monoxide and dioxide. Some gases are more apparent in their presence by their pungent smell, but some are odourless and tasteless, making them particularly hazardous. In some instances, gas detection is a relatively simple procedure, but in others it may be more difficult to control. There are many factors that companies should consider when deciding on the proper gas monitoring system. Gas detectors are especially necessary in areas where fresh air is limited and where additional dangerous situations are present. In a power generation facility, be it coal, natural gas, oil or nuclear, it’s crucial that proper gas detection and monitoring controls are put into place protecting both humans and expensive work equipment. While these lethal gases are used for the betterment of society, they also pose a serious threat to health and work environment when a high enough concentration is present. What is the importance of gas detection? Gas detection is very important to all aspects of life. Each and every year unknown gas leaks cause many people to die. It is because of this that people must take heed and get the products they need in place to keep this deadly hazard away from themselves and their family. What makes gas detection such a hard thing is that often it is odourless. You simply can’t see it or smell it and therefore you don’t know that it is there until it is too late. Henderson and Raines described (1985) the Bhopal methyl isocyanate accident in 1984 which killed 2,000-5,000 and injured tens of thousands, was the worst chemical accident in recent decades. The explosion of Ammonium Nitrate Train in Nishabor, Iran, in the current year which killed 300 and injured more than 500 people was one of the latest tragedies in this regard. As Ce´sar, Leal, Gustavo, and Santiago (2004) mentioned, the study of accidents caused by the release of flammable liquids and gases, particularly vapour cloud explosions, and greatly increased in recent decades. Atmospheric hazards in confined spaces can be difficult to accurately determine. The atmosphere should therefore be constantly monitored - it can change frequently and present different risks to workers depending on their practices and PPE. Workers should remember also that gas monitors do not protect like PPE. They are there to alert them of hazards, and because conditions can change suddenly, the monitors must be fast to respond to atmospheric conditions. The faster a detector responds, the greater the chance a worker has to take remedial action to prevent serious consequences. A gas detector is potentially a life saver, so long as users respond appropriately, so choose and use detectors well. When the sensors of a confined space gas detector recognise levels of a gas or gases that they have been programmed to detect in amounts higher than usual, an alarm normally sounds to alert the home or business owner. Sometimes another clue is used, such as flickering lights. When this occurs, everyone should be removed from the area and any items running on the gas should be turned off. The fire department should be contacted and no one should re-enter the building until it has been confirmed safe. The company which supplies the gas or gases should also be contacted to repair broken lines, or the manufacturer may have to replace or fix broken appliances or tools. Some gases are very flammable, so individuals should stay far away from any building with a gas leak. Anything which may result in a spark or flame should be avoided. In factory settings where machinery may be used during production of goods, the confined space gas detector should be designed to recognise amounts smaller than needed to ignite since many machines can cause sparks. The batteries in the detector should be tested and changed regularly so that they are in proper working order when needed. Batteries should be changed at least once every six months to a year, even if they appear to be working. It is important to buy a confined space gas detector that is designed to recognise the types of gas most likely to occur in the area. When in doubt, a multi-gas model may be the best option. A confined space gas detector is a device used to detect certain types of harmful gases in the air. Some are designed to detect only one type of gas, while others can recognise three or more gases. They are often used in factories, homes, and other areas where fresh air is limited. When a dangerous gas is detected, the device usually sounds an alarm or uses another form of warning. The use of a confined space gas detector is recommended to anyone using natural gas or businesses where various forms of gas are used regularly. Each device is designed differently, and they may each have different sensitivities. In very small areas, it does not take much gas at all to poison an individual, so confined space models should detect even the smallest of leaks to be effective. A substance that is normally in gaseous state at ordinary temperatures and pressures. A gaseous form of a substance that is liquid or solid at normal temperatures and pressures. Airborne dispersion consisting of minute particles that come from heating a solid, often an oxide resulting from a chemical reaction between the particles and oxygen. There are a number of methods used to detect the presence of various gas compounds. Typically, the most universally accepted methods are: 1. Electrochemical 2. Catalytic bead 3. Infrared 4. Paper tape 1. Electrochemical Electrochemical gas sensors contain various components designed to react with a specific toxic gas; the reaction generates a current which is measured by the instrument and translated into a concentration value (PPM or PPB). 2. Catalytic bead Catalytic sensors ‘burn’ combustible gases on a small, extremely hot bead; the instrument measures the resulting increase in resistance and translates it into percent of lower explosive limit (LEL). 3. Infrared Infrared instruments shine a ‘tuned’ beam of light through the gas sample. If the target gas is present, a portion of the beam's light spectrum is absorbed in proportion to the concentration of the gas. • Receptor points. Locations where hazardous gases could pose a threat to personnel, property or equipment How gas detectors work Gas detectors measure and indicate the concentration of certain gases in an air via different technologies. Typically employed to prevent toxic exposure and fire, gas detectors are often battery operated devices used for safety purposes. They are manufactured as portable or stationary (fixed) units and work by signifying high levels of gases through a series of audible or visible indicators, such as alarms, lights or a combination of signals. While many of the older, standard gas detector units were originally fabricated to detect one gas, modern multifunctional or multi-gas devices are capable of detecting several gases at once. Some detectors may be utilised as individual units to monitor small workspace areas, or units can be combined or linked together to create a protection system. As detectors measure a specified gas concentration, the sensor response serves as the reference point or scale. When the sensor's response surpasses a certain pre-set level, an alarm will activate to warn the user. There are various types of detectors available and the majority serve the same function: to monitor and warn of a dangerous gas level. When considering what type of detector to install, however, it is helpful to consider the different sensor technologies. Gas detectors are categorised by the type of gas they detect: combustible or toxic. Within this broad categorisation, they are further defined by the technology they use: catalytic and infrared sensors detect combustible gases and electrochemical and metal oxide semiconductor technologies generally detect toxic gases. Electrochemical sensors or cells are most commonly used in the detection of toxic gases like carbon monoxide, chlorine and nitrogen oxides. They function via electrodes signals when a gas is detected. Generally, these types of detectors are highly sensitive and give off warning signals via electrical currents. Various manufacturers produce these detectors with a digital display. Metal Oxide Semiconductors, or MOS, are also used for detecting toxic gases (commonly carbon monoxide) and work via a gas sensitive film that is composed of tin or tungsten oxides. The sensitive film reacts with gases, triggering the device when toxic levels are present. Generally, metal oxide sensors are considered efficient due to their ability to operate in low-humidity ranges. In addition, they are able to detect a range of gases, including combustibles. Catalytic sensors represent a large number of gas detector devices that are manufactured today. This technology is used to detect combustible gases such as hydrocarbon, and works via catalytic oxidation. The sensors of this type of detector are typically constructed from a platinum treated wire coil. As a combustible gas comes into contact with the catalytic surface, it is oxidised and the wiring resistance is changed by heat that is released. A bridge circuit is typically used to indicate the resistance change. Infrared sensors or IR detectors work via a system of transmitters and receivers to detect combustible gases, specifically hydrocarbon vapours. Typically, the transmitters are light sources and receivers are light detectors. If a gas is present in the optical path, it will interfere with the power of the light transmission between the transmitter and receiver. The altered state of light determines if and what type of gas is present. Legislation is the primary driver for the use of gas detectors in the workplace. In the EU, member states must enact directives through their own regulations. Although directives may not explicitly mention gas detectors, they may refer to them indirectly through equipment safety control and monitoring. For example, the Chemical Agents Directive 98/24/EC Protection of the health and safety of workers from the risks from chemical agents, (implemented in the UK as the Control of Substances Hazardous to Health Regulations) states that, to prevent or control exposure, (e.g. where required by the safety and health document) monitoring devices measuring gas concentrations at specified places (automatically and continuously), automatic alarms and devices to cut off power automatically from electrical installations and internal combustion engines, must be provided. Another key piece of legislation in the UK is the Confined Space Regulations which states that so far as is reasonably practicable, no person at work shall enter or carry out any work in or (other than as a result of an emergency) leave a confined space otherwise than in accordance with a safe system of work. In recent years the harmonisation of standards throughout Europe has led to the publication of many new standards covering performance and use of gas detecting instruments and systems. For toxic gas detection, the EN 45544 (Parts 1-4) series of standards, generically entitled 'Workplace atmospheres - electrical apparatus used for the direct detection and direct concentration measurement of toxic gases and vapours' has been published. New standards for flammable gas detectors (EN 60079-29-1 and 60079-29-2) have emerged, a revised standard for oxygen detectors (EN 50104) is imminent, and work is in progress to produce a EN standard for carbon monoxide and carbon dioxide detectors for indoor air quality, including commercial applications. 1. Orientation - Always mount the sensor pointing downwards. 2. Gas Density - For gases heavier than air, it is recommended that the sensor be installed approximately 18" from floor level. In these applications care should be taken to protect the sensors from physical damage. 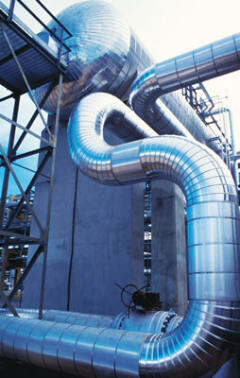 For gases that are lighter than air, sensors should be installed at a high level or close to the potential leak source. 3. Potential Gas Sources - The location and nature of potential vapour/gas sources (e.g. pressure, amount, source, temperature, and distance) need to be assessed. 4. Ambient Temperature - Ensure that the system is located within an area that complies with the specified operating temperature range. 5. Vibration - Mount the transmitter and sensor in a manner that minimises vibration. 6. Accessibility - When determining mounting location, consider future maintenance and calibration requirements. 7. Avoid water and condensing humidity. Droplets adhering to the outer membrane of the sensor will reduce or negate sensor performance. A rain shield is recommended for outdoor installations. 8. Avoid strong electromagnetic fields. Mounting the gas transmitter near power transformers or other strong EM fields may cause undesirable results. 9. Avoid pressure and excessive air velocity. Gas sensors are designed to measure gas concentration under normal atmospheric conditions with up to 1 LPM air flow. High air velocities will result in inaccurate measurement and reduce sensor life. 10. Conduit Seals - Protect the transmitter electronics from moisture by thoroughly sealing the conduit entries and tightening the cover of the transmitter housing. 11. Distance - All systems that separate the gas sensor (or transmitter) from the main controller electronics have distance limit specifications. Ensure that the application’s distance requirements are within specifications and that the appropriate gauge wiring is used. OSHA 1910.146 'permit-required confined spaces' paragraph (c) (5) (ii) (C) explicitly states (in part) that, “Before an employee enters the space, the internal atmosphere shall be tested, with a calibrated direct reading instrument.” OSHA Compliance Directive CPL 2.100, 'Application of the Permit-Required Confined Spaces (PRCS) Standards, 29 CFR 1910.146' explains what is meant by 'calibrated': In general, the lower your measuring range, and the greater accuracy you desire, then the more frequently you should calibrate. Calibration monthly is a good median recommendation, and bi-monthly is even better. Calibration/bump test All portable gas detectors should be calibrated according to the manufacturer’s recommendations. Not calibrating or bump testing a gas detector on a regular basis is an invitation to disaster. Sensors and/or electronics can and do fail, and it is only prudent to check your instrument on a regular basis. a) Bump test A bump or field test is the application of a known gas concentration in excess of the calibrated alarm point of the instrument. When this gas is applied to the gas detector it should trip the alarm point ensuring that the instrument is functioning correctly. If it does not then it indicates that a re-calibration is necessary. Multiple gas mixtures are available that allow you to do a simultaneous bump test with one canister of gas. It is a good policy to bump test at least once a week. b) Calibration Calibration should be performed as per the manufacturer’s recommendations. Calibration is done with a known gas concentration that can be at the exact alarm point or at a higher concentration where the set point can be adjusted. This varies between manufacturers. If you are bump/field testing on a regular basis you can wait until those tests indicate a re-calibration is required. If bump/field tests are not performed then the unit should be re-calibrated on a regular basis. Manufacturers' recommendations vary from daily to never. Daily may not be practical and never, while time saving can be an invitation to disaster. Somewhere in between is the answer. Every three to six months is common. Understanding the best practice for effective gas detection requires knowledge of the application as well as the properties of the gases or volatiles within the application. This knowledge will help the hazard management team make the best decisions in determining what type of gas detector technology to use and where to place the detector to ensure detection in the event of a leak.